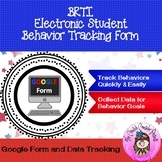 Have students track their own behavior with this easy to use checklist. Comes in two borders for Elementary and High School. Suggested use: Print double sided, laminate, and have students use with dry erase markers! Easy Student Behavior Checklist for students. Geared for Middle School students but can be used for students grades 3 and up. 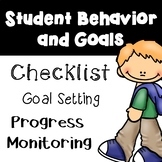 The Student's Behavior Checklist is a component of the Levels of Development, Behavior and Academic Management System. 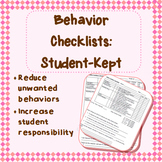 The checklist allows students to assess their own behavior. It is important for students to be honest in order to ensure that true growth and development occur. This is a documentation checklist of behavior interventions/steps you as a teacher have taken to keep account of student behavior in your class or to reference during a parent/teacher conference. This is a checklist that I use in class to keep track of student's behavior or responsibilities. It quickly lets me know who is not in class on time, does not bring supplies or talks to neighbors. This Behavior Checklist was created by Eastwood Schools RtI team to help teachers and teams pinpoint problematic behaviors to guide the creation of a behavior plan. Targeting specific behaviors leads to more specific intervention and higher success rates. This is a checklist that I use when I need to pay special attention to a student's behavior. Since there is not a lot of time while you are teaching to write things out, a checklist makes a lot more sense. This document can also be used to communicate with parents on a regular basis. This is a checklist for a student I created who was having a difficult time staying on task throughout the day. They get a check for every task they complete and earn rewards or consequence(at home or school) based on the number of checks they earn. This Classroom Observation Checklist by The Resourceful Teacher is used to assess student behavior in the classroom. 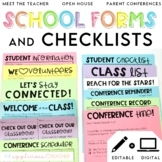 The checklist can also determine if a student is in need of Resource or Special Education. ~♡~♡~♡~♡~♡~♡~♡~♡~♡~♡~♡~♡~♡~♡~♡~♡~♡~♡~♡~♡~♡~♡~~♡~♡~♡~♡~♡~♡~♡~ DON'T MISS THESE FREEBIES! This checklist--written as "I chose to.."--can be used to report positive choices and negative choices to parents. The checklist works as a daily personal behavior management and communication system or given as needed for each student.